In case of fire exit signs can save lives. SACO features LED exit signs to comply with building fire codes and insurance standards. These energy-saving, illuminated, long-life LED exit signs use less than 5 watts of power, lowering your energy consumption and saving you money every month. We offer a wide range of designs and features for LED exit signs including: architecturally distinct edge lit exit signs, beautiful cast aluminium exit signs, high end exit signs, rugged steel exit signs, water resistant wet location exit signs and time saving self testing exit signs. 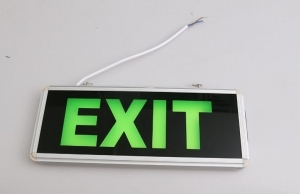 We also feature a large selection of photoluminescent exit signs which are non-electrical, eliminating operating costs. They provide exceptional reliability and efficiency as they do not require electricity or batteries to operate, making them maintenance free, and easy to install. Our selection of photoluminescent exit signs also comply with Local Law building and fire safety codes.